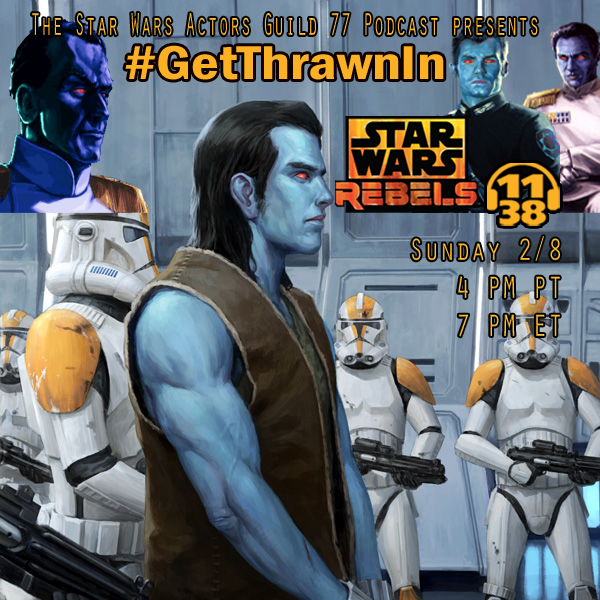 ← #GetThrawnInStarWarsRebels #SWEU – Let’s do it! This idea is partially based off of the “CALL TO ACTION” episode in Star Wars Rebels that had GRAND MOFF TARKIN in it. It was an extraordinary episode, but still bittersweet to Star Wars Expanded Universe (EU) fans. Despite what you think of the Star Wars Actors Guild 77, the fact is, we do love the EU, but we also like positive Star Wars fandom through non-violent action. Our action is to use social media constructively to show Disney Lucasfilm the efficacy of putting the fictional character, MITTH’RAW’NURUODO or THRAWN in the Star Wars Rebels timeline, continuity and story arc. We have to PITCH the idea to Disney Lucasfilm despite the current contracts. We feel that a strong social media metric can persuade Disney Lucasfilm to reconsider this character THRAWN from the Star Wars EU. Our abundant collection of data: roleplay story arcs, character sheets, financial budgets, social media campaign, voice actor work and videos MERIT a pitch. This is our pitch bible. It will take a year to bring this project into fruition, but this campaign is a positive, non-violent and compassionate fandom that brings support and promotes all of Star Wars. This entry was posted in Characters, Podcasts77, Star Wars Pages, Star Wars Podcast, Star Wars Rebels, SWAG 77, SWAG 77 Business, SWAG 77 Reads and tagged Chiss, Get Thrawn In, Grand Admiral Thrawn, Mitth'raw'nuruodo, Star Wars Actors Guild 77, Star Wars Rebels, SWAG 77 Podcast. Bookmark the permalink.